Did you know that by the Act of 1774 all cotton cloth could legally be sold and printed for use in Britain? but it had to have three blue threads woven into the selvedges of the cotton of English manufactures to identify it for payment of duty, this continued and was dropped in 1811. I find the history of our textiles so fascinating and thought you may as well. Some of the facts will help you identify ages of some fabrics if you are searching at jumble sales or vintage fairs. 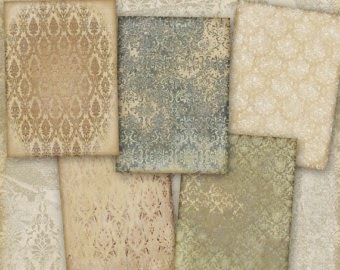 Damask is a patterned textile with one warp and one weft in which the design is formed by a contrast of binding systems which give shiny warp face areas and matte weft areas. In its classic form it is reversible and the contrast is produced by the warp and weft faces of the same weave. Glazed cottons has a shiny surface achieved by various chemical or physical finishing processes. 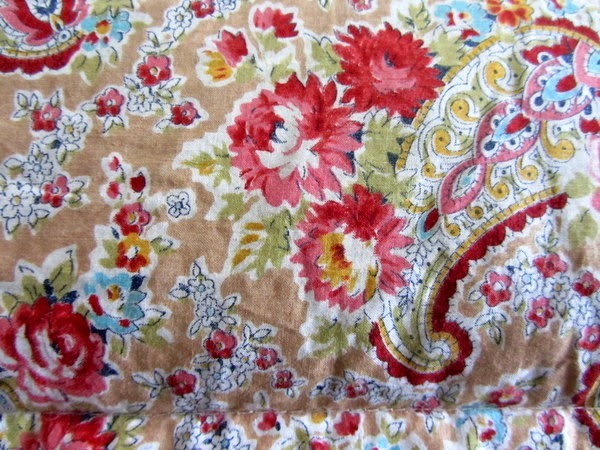 This is lost when washed.... often found on unused eiderdown fabrics! so could be between 1920 -1950. Clouds .. silks printed on the warp before weaving were called 'clouds'in England and chine in France. They were specially fashionable in the second half of the 18th Century. When woven, the colour printed on the warp is muted by the uncoloured weft, hence the name. Demy Chinz in the mid 18th Century the 'half chinz' was composed of red, blue and yellow, which could be overprinted to produce other colours but lacked the extra reds and pruples of the 'whole chinz'. By the early 19th Century the term 'demy' or 'demi-chinz' had a more restricted range, fewer than five colours, and was often used to denote the 'drab' style, with no reds at all. Some of the above will be helpful when you are looking at fabrics, I will also do a blog about early manufactures as well which might prove useful for you. I hope you have a great Monday and have a great day! Vintage eiderdown fabric with the protective layer on. of green paisley if you remember.. what a find!